*Corresponding Author: Dr Subhendu Kumar Boral, MBBS, MD (AIIMS), DNB “Keshab Residency”, 138 Keshab Chandra Sen Street, Block II, Flat 1E, Amherst Street Kolkata - 700009, West Bengal, India. Aim: To calculate AIP & to find correlation between hole closure pattern with AIP in idiopathic Full Thickness Macular Hole (FTMH) cases. Method: In this prospective, non-randomised interventional single blind study, 105 eyes of symptomatic FTMH (< 6month duration) were operated. Minimal diameter of macular hole (MDMH) was calculated on OCT, divided into Group I (>400μ, n=75) & Group II (<400μ, n=30). 23G vitrectomy, ILM peeling, gas injection done in all & recorded. Final AIP calculated using Adobe photoshop CS2 (PSD format) in disc diameter (DD) from still frame. A minimum of 6 month follow up done after surgery in all and further follow up done at 6monthly interval upto a maximum of 5 years after surgery. Results: FTMH closed in 92.38% eyes. 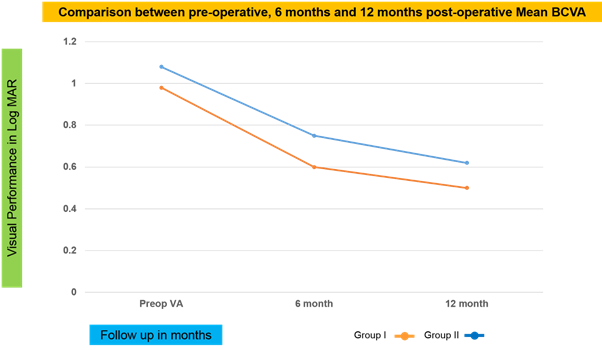 In Group I, mean preoperative BCVA was 1.14 ± 0.39 logMAR and improved to 0.79 ± 0.26 logMAR postoperatively at 6 month. 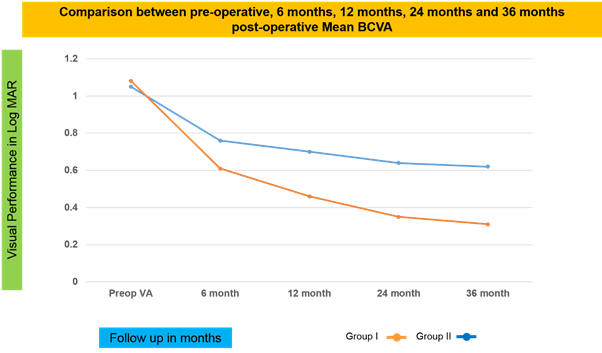 In Group II, mean preoperative BCVA was 0.95 ± 0.44 logMAR and improved to 0.60 ± 0.24 log MAR af-ter surgery. When AIP >3DD, Type I & Type II closure were 72.77% & 27.27% in Group I (p<0.01) and 84.21% & 15.79% in Group II (p<0.01). Conclusion: AIP can be calculated using Adobe photoshop CS2. Type I closure was sig-nificantly high with AIP >3DD in both groups. Intra-operatively using video overlay, surgeon can increase the diameter of AIP, to get better closure pattern post-operatively. This theory has been additionally reinforced by successful treatments  of MH with cortical vitreous peeling. Thus, both removal of the posterior cortical vitreous and posterior vitreous detachment are thought to relieve these traction forces and be a predictive factor to MH development.The proposed mechanisms seem to be contradicted by a number of patients in which a MH develops after a complete posterior vitreous detachment [8,9] or even after pars plana vitrectomy (PPV). Classic macular hole surgery consists of vitrectomy with posterior vitreous cortex sepa-ration to relieve antero-posterior and centrifugal tangential traction and intraocular gas tam-ponade at the end of surgery to promote retinal reattachment by virtue of its surface tension and facilitating flattening and reposition of macular hole edges. Shinodo H., et al. mentioned that the standard recommendation was to peel ILM of  around 2 disc diameter (DD) in size, centering macular hole in general. OCT plays an important role in predicting surgical outcomes in macular hole surgery. Pre-operative Macular Hole Index (MHI), considering mid-hole diameter and basal diameter, is an well established prognostic factor for visual outcome. Kusuhara S., et al. showed BCVA  was better in the MHI ≥ 0.5 group than that in the MHI < 0.5 group. Ip MS., et al. showed successful anatomical closure in 92% eyes with preoperative macular hole diameter < 400μ,  but only in 56% eyes with macular hole diameter > 400μ. Post-operatively, macular hole closure pattern on OCT is also variable and not much predictable also. It can be of two types - Type I closure of macular hole is closed macular hole without any foveal neurosensory retinal defect and Type II closure is closed macular [16,17] hole with foveal neurosensory retinal defect. In study done by Kang SW., et al. TypeI closure  was 61.3% and TypeII closure was 38.7%. Macular hole is considered as open when there is persistent defect in foveal neurosensory retina with surrounding serous detachment at it’s base. The previous studies did not highlighted the fact that how much area of ILM has to be peeled for better centripetal tissue mobilisation according to the pre-operative macular hole diameter to ensure post-operative macular hole closure without any foveal neurosensory retinal defect. 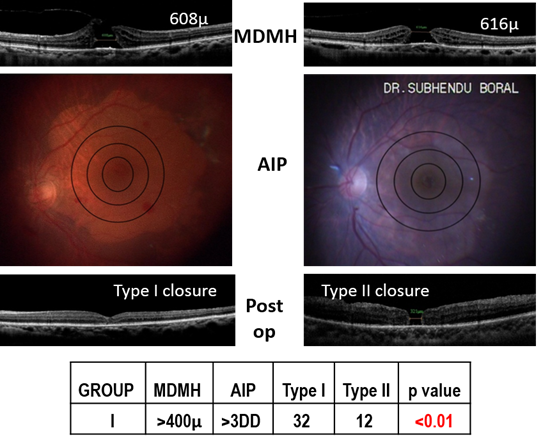 The purpose of this study was to find correlation between macular hole closure pattern on postoperative OCT with area of ILM peeled in idiopathic FTMH cases. In this prospective, non randomised single blind study, 105 eyes of 105 patients with symptomatic idiopathic FTMH with less than 6 months duration, had been oper-ated by three vitreoretinal surgeons in Disha Eye Hospitals Pvt Ltd, Barrackpore, West Ben-gal, India from April 2008 to September 2010 and followed up till December 2016. Triamci-nolone acetonide assisted sutureless 23G vitrectomy were performed in all cases along with induction of posterior vitreous detachment and it’s removal. 0.05% Brilliant Blue G (BBG) stained Internal Limiting Membranes (ILM) were peeled using 23G Tanno’s scratcher and end-grasping forceps, followed by total fluid air exchange. Perfluoropropane (C3F8) gas in isoexpansile concentration was used as tamponade. All surgeries were video recorded. Post- operatively, prone position was maintained for at least 7 days. Post-operative follow-up was for at least 6 months. Included cases were idiopathic full thickness macular holes of all stages (stage II, III and IV). All other types of macular holes with secondary origin, including traumatic cases, cases with epimacular membrane, cystoids macular oedema etc. Disc diameter <1.5mm & >1.9mm. Area of ILM Peeled (AIP)- A novel technique was introduced to calculate AIP. Per- opera-tive Area of ILM Peeled (AIP) had been calculated from the recorded video. Still frame of the final Area of ILM Peeled (AIP) had been taken using Adobe photoshop CS2 (in PSD format). Final AIP, centering macular hole had been calculated according to the longest disc diameter(DD) using three equidistant concentric rings with enlarging diameter( 1DD, 2DD and 3DD) and divided into two groups—more than 3DD & less than 3DD, depending on whether the margin of ILM peeled area is covering the 3DD circle in at least three quadrants or not. AIP had been measured in the following way : a) 3 equidistant concen-tric circles were made in Adobe photoshop CS2 in PSD format (Figure 1), b) smallest circle was fitted according to the longest disc diameter in the final still frame of the ILM peeling from the recorded video (Figure 2) and c) now these three circles were shifted to the ILM peeled area to note whether the margin of the ILM peeled area was crossing the outer-most circle in at least in three quadrants or not, depending on it would be >3DD or <3DD (Figure 3). Pre-operative Minimal diameters of macular holes (MDMH) - measured on Spectral Do-main OCT using callipers, divided into two groups–GroupI (with MDMH >400μ, n=75) & GroupII (with MDMH <400μ, n=30). Post-operative macular hole closure pattern on SD-OCT - performed in all either after 7days or 14 days (if closure pattern was certain on 7th day OCT) and to note Type I, Type II or open closure pattern. OCT-technician was aware of pre-operative MDMH and surgeons remained at blind-end, without knowing the pre-operative MDMH. 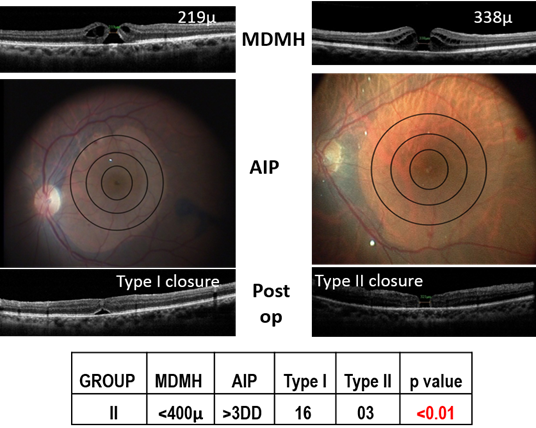 Per operative AIP had been calculated in all using described method and on considering pre-operative MDMH, relation between per operative AIP and post-operative macular hole closure pattern were statistically analysed. FTMHs were closed on post-operative SD-OCT in 97/105(92.38%) eyes. In Group I, closure rate was - 67/75 (89.33%) eyes and in Group II, it was 30/30 (100%) eyes. Clinical and demographical profile of both group have been described in Table 1 and Table 2. Overall pre & postoperative mean Best Corrected Visual Acuity (BCVA) were 1.09±0.41 & 0.73±0.26 logMAR respectively. In Group I, mean preoperative BCVA was 1.14 ± 0.39 logMAR and im-proved to 0.79 ± 0.26 logMAR postoperatively. 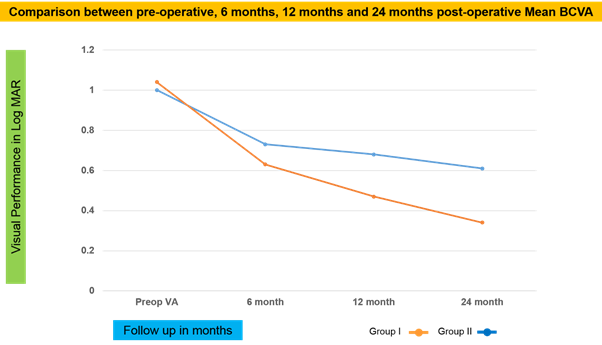 In GroupII, mean preoperative BCVA was 0.95 ± 0.44 logMAR and improved to 0.60 ± 0.24 log MAR after surgery. (Table 3). Table 3: Shows pre and post operative best corrected visual acuity (BCVA) in both groups. In Group I, mean MDMH was 618.45 ± 143.45 μ and in Group II, it was 273.53 ± 64.64 μ. The closure patterns (whether Type I or Type II) were variable according to the area of ILM peeled and pre-operative MDMH (Table 4). Table 4: Shows relationship between Area of ILM Peeled (AIP) and Macular hole closure pattern, considering pre-operative Minimal Diameter of Macular Hole (MDMH). Combined phacoemulsification with IOL implantation and macular hole surgery done in twenty patients in Group I and 5 patients in Group II. 25 patients in GroupI and 9 patients in Group II were phakic. 30 patients in Group I and 16 patients in Group II were pseudophakic. In Group I, Type I & Type II closure were seen in 32/44 (72.73%) eyes and 12/44 (27.27%) eyes respectively (p value < 0.01, statistically significant) when AIP was more than 3DD in size (Figure 4). In Group II, Type I & Type II closure were seen in 16/19 (84.21%) and 3/19 (15.79%) eyes when AIP was more than 3DD in size (p value < 0.01, statistically signifi-cant) (Figure 5). In our study, macular hole remained open in 8/75 patients of Group I after intervention. In 4 out 8 patients with open macular hole, AIP was >3DD and in rest of 4 patients, AIP was < 3 DD in size. For open macular holes, repeat ILM peeling with fluid air exchange with long acting C3F8 gas injection done. Only one case in Group I (Case no.23 in Table 1) developed retinal detachment after surgery. All patients underwent at least 6 month follow up. 49 patients (Group I=29, Group II= 20). Completed 12 months follow up. 25 patients (Group I = 14, Group II = 11) completed 24 months follow up. 18 patients (Group I = 12, Group II = 6) completed 36months follow up and 12 patients (Group I = 8, Group II = 4) completed 42 months follow up. Only 8 patients (Group I = 5, Group II = 3) completed five years follow up. Visual improvements in both groups are de-picted in the charts (Figures 6 ,7,8,9). Reports of more than 90% primary closure have appeared in the literature claiming that ILM peeling was the single most important variable. The idea to calculate the ILM peeled area came to our mind from our previous observations that in small sized macu-lar hole of less than 400μ in diameter, Type I closure was not happening in all, but even in large sized macular hole of more than 400μ in diameter, Type I closure was possible. We thought, it must be related to the relative degree of centrifugal traction, which can be re-leased more by ILM peeling for better mobilisation of peri hole retinal tissue. In our study, the measurement of AIP in longest disc diameter was possible by using Adobe photoshop CS2 in PSD format by three equidistant concentric circle of enlarging diameter (i.e 1DD, 2DD and 3DD). Often, ILM peeled area is not perfectly circular; many a times, AIP may be oval, irreg-ular or oblong shaped. 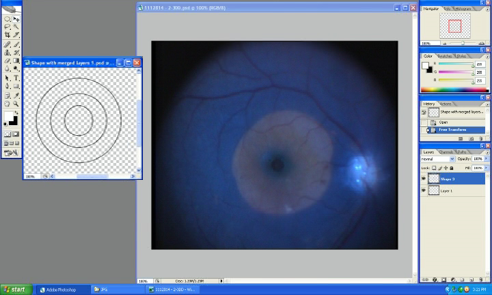 So we decided to measure the size of AIP by taking the still frame of final AIP from the recorded video and the margin of this final AIP should cover the 3DD circle margin in at least 3 quadrants, centering macular hole. Pre-operatively, minimal diameter of the macular holes were measured as these mar-gins have highest propensity to appose. In the literature, the incidence of Type I closure was 61.3% and Type II closure was  38.7%. We have seen in GroupI eyes with MDMH >400μ size, when we peeled ILM of more than 3DD in size, there was a significantly high (p<0.01) incidence of Type I closure (72.73% vs 27.27%). But in these large sized macular holes, when we peeled ILM of less than 3DD in size, the incidence of Type I closure came down to 34.78% and Type II clo-sure pattern became 65.22%; but here the difference was statistically less significant. Simi-larly, in GroupII with MDMH <400μ in size, when we peeled ILM of more than 3DD in size, Type I and TypeII closure were 84.21% and 15.79%( p<0.01-statistically significant); but when we peeled ILM of less than 3DD in size, incidence of Type I closure was only 72.73% and Type II closure pattern was 27.27% which was statistically not significant. In this aspect, our study can be regarded as a pilot study, as till of now, no other study highlighted the logi-cal reproducible method to calculate area of ILM peeled and related the association between intra-operative ILM peeled area and post-operative pattern of macular hole closure. The application of this three equidistant concentric circle, made in Adobe photoshop is we can use it intra-operatively as a video overlay. We named this video overlay as “Boral’s Ring”. 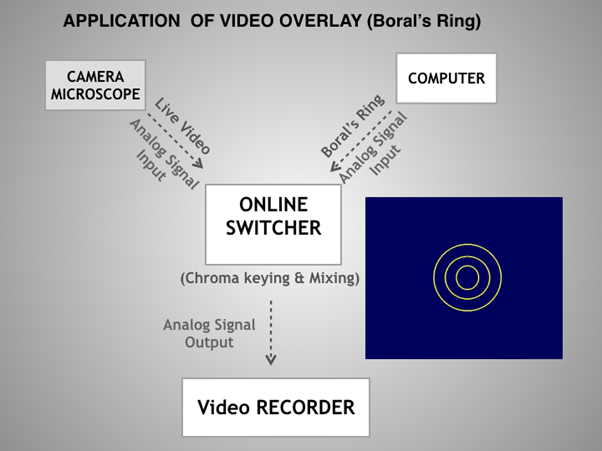 An online switcher is required for chroma keying and mixing using two analog inputs,one from camera microscope as live video and another from computer as video overlay (“Bo-ral’s Ring”). The final analog signal input will go to the video recorder (Figures 10) so that the sur-geon can use this video overlay intra-operatively to calculate ILM peeled area in respect to the disc diameter. Intra-operatively, surgeon can enlarge the area of ILM peeled by peeling more ILM (Figures 11-16), according to the preoperative MDMH to ensure better closure pattern. As majority of the patients in our study were having large sized macular hole with relative-ly poorer visual recovery, long term follow up was less. Postoperative outer retinal layer integrity is associated with better final retinal sensitivity. AIP can be calculated using Adobe Photoshop CS2. As there is no definite standard method to calculate the AIP, this is a novel method to measure how much area of ILM has been peeled. We have seen Type I closure was significantly higher when AIP was more than 3DD in size in both groups. Intra-operatively using video overlay of 3 equidistant concentric rings, surgeon can increase the diameter of ILM peeled area, according to the pre-operative minimal diameter of macular hole, to ensure a better closure pattern postopera-tively. Fine S. (1993). Macular holes. Ophthalmology100: 871. Rees AB, Jones IS, Cooper WC (1967). Macular changes secondary to vitreous traction. Am J Ophthalmol 64 : 544-549. Gass JD. (1995). Reappraisal of biomicroscopic classification of stages of development of a macular hole. Am J Ophthalmol 119(6): 752–9. Gass JDM. (1988). Idiopathic senile macular holes: its early stages and pathogenesis. Arch Oph- thalmol 106:629-39. Gaudric A, Haouchine B, Massin P, et al. (1999). Macular hole formation: new data provided by optical coherence tomography. Arch Ophthalmol 117(6): 744–51. Duker JS, Kaiser PK, Binder S, et al. (2013). The International Vitreomacular Traction Study Group classification of vitreomacular adhesion, traction, and macular hole. Ophthalmolo-gy. 120 (12): 2611–9. Kelly NE, Wendel RT. (1991). Vitreous surgery for idiopathic macular holes. Results of a pilot study. Arch Ophthalmol 109(5):654–9. Gordon LW, Glaser BM, Ie D., et al. (1995). Full-thickness macular hole formation in eyes with a pre-existing complete posterior vitreous detachment. Ophthalmology 102(11): 1702–5. Smiddy WE. (2008). Macular hole formation without vitreofoveal traction. Arch Ophthalmol 126(5): 737–8. Citation: Subhendu Kumar Boral, Arnab Das, Tushar Kanti Sinha and Bimal Roy. (2019). 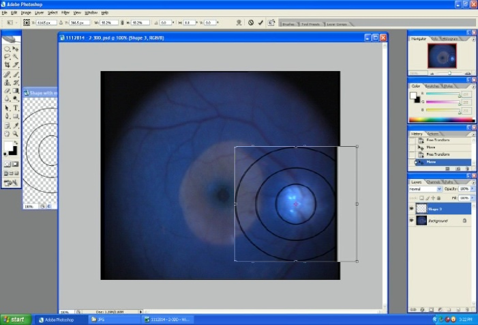 A Novel Standardised Reproducible Method to Calculate the Area of Internal Limiting Mem-brane Peeled (AIP) intra-operatively in Macular Hole Surgery by Using a Video Overlay (“Bo-ral’s Ring”) - A Long-term study in cases of Idiopathic Macular Holes. Journal of Ophthalmology and Vision Research 1(1). Copyright: © 2019 Subhendu Kumar Boral. This is an open-access article distributed under the terms of the Creative Commons Attribution License, which permits unrestricted use, distribution, and reproduction in any medium, provided the original author and source are credited.